Welcome to the launch of my third novel in the ‘Destiny’ series – ‘Queen of Clubs’. This book continues the story of the Carter dynasty from its humble beginnings in rural Norfolk (UK) to its ascendant position as a major construction company now run by chief executive, Emma Malikov, following the tragic death of her husband. It’s now the mid 1970’s. England is in political turmoil as the Conservative government introduces a three day working week to counter union unrest. An election is threatened with the prospect of a Labour Government sweeping to power. Internationally, the established order is under threat with the rise of radical urban guerrilla groups such as the Red Army Faction in Germany and the Symbionese Liberation Army in California. 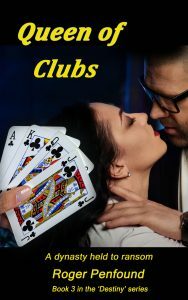 As Emma Malikov struggles to keep her construction business solvent in the face of political chaos and institutional corruption, she also has to deal with the chain of ‘Cassandra’ night clubs which she inherited from her former crime boss lover who is now serving time in prison for manslaughter. Under her direction, the clubs have prospered and have attracted the attention of a US investor who wants to establish the brand in Las Vegas. Whilst coping with the pressures of work, Emma also has to deal with the challenge of raising her family. Her stepson, Michael, is destined to take over the running of Carter’s Construction but politically is inclining towards the radical left, egged on by his girlfriend who still carries the scars of being raised in the apocalypse of post war France. Emma’s husband, who she pulled from the ranks of the company and promoted to CEO of Carter’s, has embarked on an affair leaving Emma free to rekindle a relationship with an old flame who is on the verge of ministerial office in a new Labour government. As if life wasn’t complex enough, Emma discovers that her former lover, Lester Miller, is about to be freed from prison on parole and is seeking her help to provide employment which has been made a condition of his release. Suddenly Emma’s life is thrown into turmoil when her stepson, Michael, is kidnapped by a radical anarchist group aligned with other cells in America and Europe. With Lester advising her, they begin to suspect connections between the kidnap and the powerful US investor who is seeking to buy into Cassandra’s. Meanwhile, Michael’s kidnappers have set their sights on a bigger prize. They plan to kidnap an controversial UK politician to publicize their cause and demand that Michael takes an active part in their scheme. Although he has ideological sympathies with the radical left, he is also tied by loyalties to his family and is forced to tread a very delicate path between acquiescence and disobedience. With the arrival of the US investor in the UK and the deadline for a ransom demand running out, Emma and Lester resort to the use old under world contacts to break the deadlock and find Michael before he is drawn into a crime which would threaten his future and the survival of the Carter dynasty.